We all get drilled with certain lessons in life. Sometimes it takes repeated expressions to really get it into you, and other times one powerful experience drives the point home forever. Here are 5 shocking things I’ve discovered about life at this point in my life. For some, in their reality, it is marriages being delayed. You had wanted to be married at certain age, but you're now older and wondering. For some, in their reality, it is child birth being delayed. You had wanted to have a baby immediately after, but not yet. For some, in their reality, it is finding a job being difficult. You know you're smart but no organization has seen that. For some, it is getting into school taking a toll. So many things you can't explain. 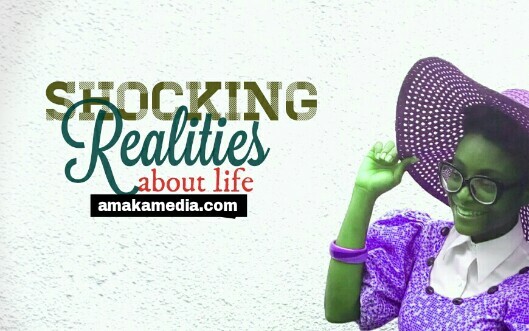 We realize these "realities" mostly when we are alone and it can be disappointing than shocking. Shocking reality literally shocks you to the bones and marrow. It shakes your view about life. It's a rude awakening. It’s easy for you to be tricked into thinking that the only thing that matters is what you’re looking at right now. There is actually more ahead of you. When I think one thing is happening, my mind tells me it's something else so I struggle to keep up with reality at times. The primary cause of depression and defeat is never what the current situation looks like but your thoughts about it. You have to stop thinking, rethinking, and then over thinking. Stop magnifying these issues. Happiness and victory really comes down to two elements: the way you think and the way you act based upon your thoughts. What if you the issues you had amplified for weeks, months, years, never really existed? Shocker! You see their always-happy pictures on social media, and you crave their life. You see the couples holding hands, and you crave their marriage. You see them looking cute on their way to work, and you crave their job. You start to think you have the worst life. Nobody's life is perfect, trust me. We all have our struggles in life, we all have our story that has molded us into who we are today - What makes us tick, what drives us, and ultimately what prevents us from moving forward. Ever think your life is the worst, then you find out your colleague who’s been smiling about their day, actually got a loan higher than their salary and have no real way of paying it back? Shocker! Sweetie, stay in your lane. Focus on your own journey. Someone says something to you and you’re offended. You think they’re being a pain in the neck, because you have a personal rule that says, “If you say X to someone, it’s because you want to insult them.” But that other person doesn’t necessarily have the same rules as you have. They’re responding according to their own rules, and in all probability, their rules say that they are responding appropriately. They may even think that you are the bad person. So who’s right? Neither; you simply have different rules. When you realize that everyone is trying to do the best they can in life with what they have and do not have the time to hate on you or hurt you, shocker! Sweetheart, people are out there living on their own terms. This is the most shocking reality for me. I used to think most Christians out there have a genuine, honest, loving heart (not saying I do tho), until the least person I expect does or says something hurtful without a second thought. Honestly, this has weakened me to trust people. I have become scared of people. They appear to be all sweet and nice, but end them up being a demon. Thank God the Bible doesn't say "Trust people". It says "Trust God" and "Love people". Phew. What a relief! When you realize that the anointed one who you think is praying for you and encouraging you along the path, is on a mission to distract you. Shocker! It’s during the toughest times of your life that you’ll get to see the true colours of the people who say they care about you. Notice who sticks around and who doesn’t, and be grateful to those who leave you, for they have given you the room to grow in the space they abandoned, and the awareness to appreciate the people who loved you when you didn't deserve it. Stop looking back, there is nothing there for you anymore. With everything that has happened, you can either feel sorry for yourself or treat what has happened as a gift of knowledge. Everything is either an opportunity to learn and grow or a block that keeps you stuck. You get to choose. What if the strong emotions about something that happened in your past is hindering your ability to live productively in the present? Shocker! Take a deep breath. It’s going to be OK . . . maybe not today, but eventually. There will be times when it seems like everything that could possibly go wrong is going wrong. You might feel like you will be stuck in this rut forever, but you won’t. Sometimes it’s just a matter of us staying as positive as possible in order to make it to see the sunshine break through the clouds again. It's two weeks after my birthday. Not very experienced as of now but, whatever I have seen in life up till now, is a part of what I am today. What would you add to this post? What’s one shocking reality you’ve had to face, or hardship you’ve had to deal with, that helped you grow?